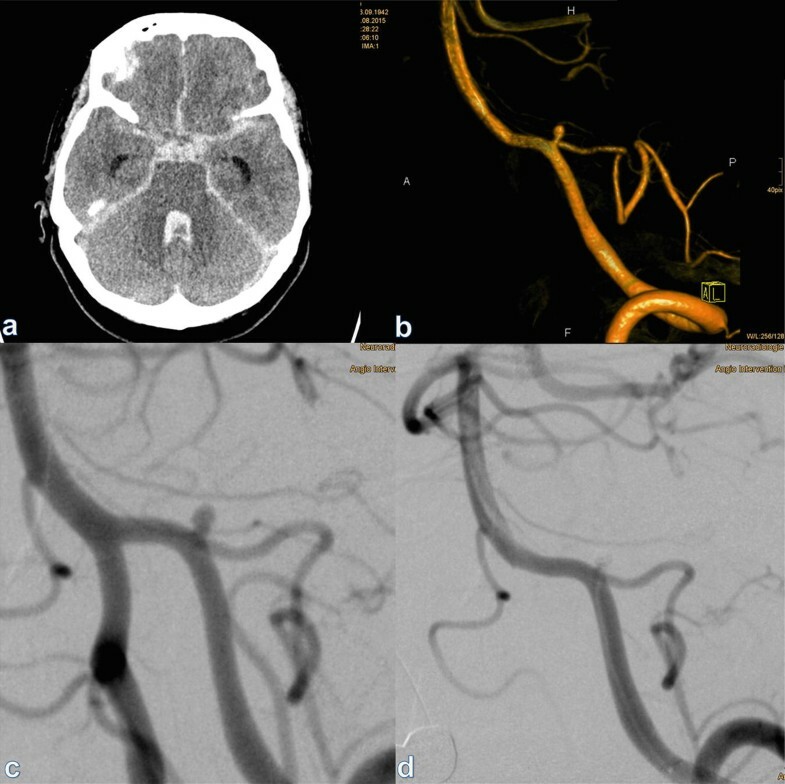 The following presentation describes the clinical and radiological findings of a 75-year-old woman who presented due to spontaneous subarachnoid hemorrhage (SAH), caused by the rupture of a very small aneurysm located at the anterior communicating artery (AcomA). 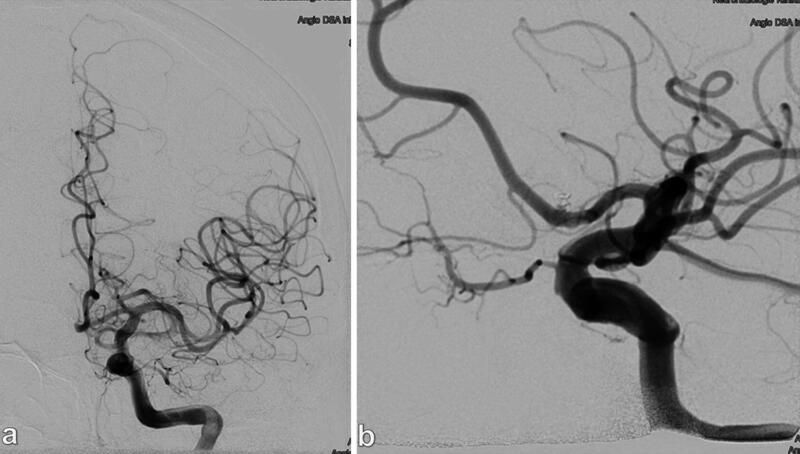 The aneurysm was subsequently treated by endovascular placement of a single 3D coil. Good clinical outcome was achieved despite the advanced age of the patient. The complete occlusion of the treated aneurysm was stable over the follow-up period of 24 months. Although the risk of rupture of small and very small aneurysm is allegedly “exceedingly” low, according to International Study of Unruptured Intracranial Aneurysms (ISUIA), yet most of the ruptured aneurysms encountered in daily practice are in fact small. 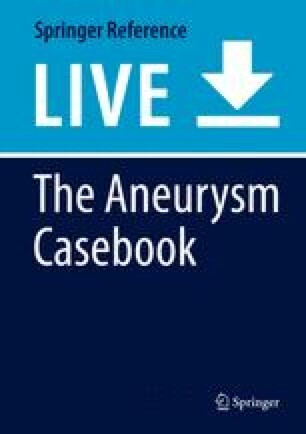 The presented case is just one of innumerous examples of ruptured (very) small aneurysms. This previously healthy patient experienced a sudden and severe headache accompanied by nausea and vomiting followed by confusion. She was admitted to the emergency department of the nearest hospital with a systolic blood pressure of 210 mmHg. 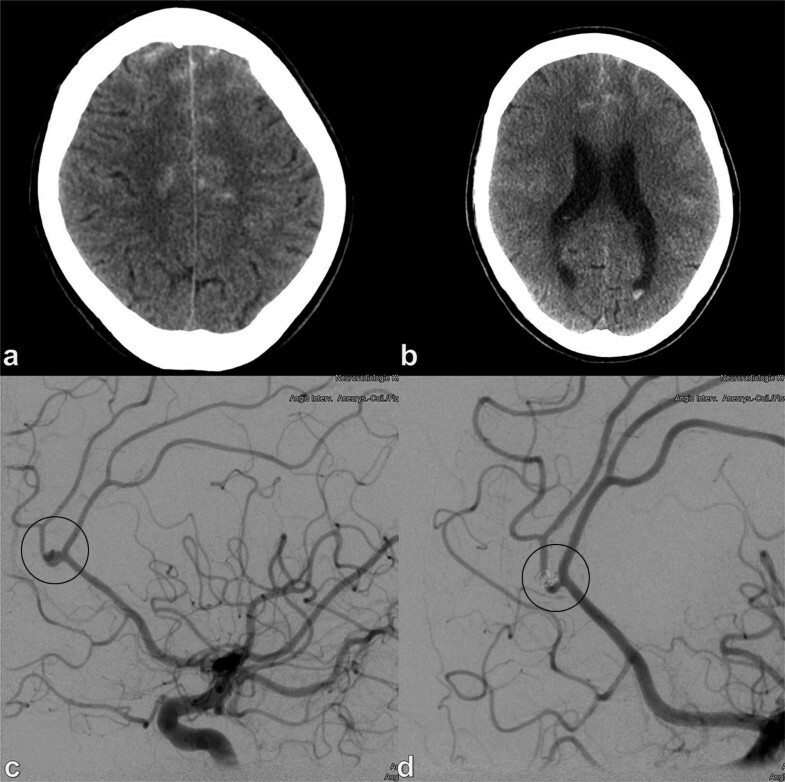 The emergent computer tomography (CT) of the head revealed diffuse subarachnoid hemorrhage (SAH). The patient was then promptly referred to our center for further management. The clinical condition at presentation was graded as Hunt and Hess III. The cranial CT at admission showed diffuse SAH with no preferential distribution (Fisher IV). Hemorrhagic sedimentations were evident in the lateral ventricles and at the level of the foramen of Magendie (Fig. 1). The CT-angiography was unremarkable. An external ventricular drain (EVD) was inserted due to the dilatation of the lateral ventricles and the patient was transferred to the angiography suite for conventional angiography. The selective injection of the left internal carotid artery (ICA) revealed a small saccular aneurysm of the anterior communicating artery (AcomA), measuring 2 mm in maximal diameter and 1.3 mm at the level of the neck (Fig. 2). The goal of the treatment was the prevention of a recurrent SAH. 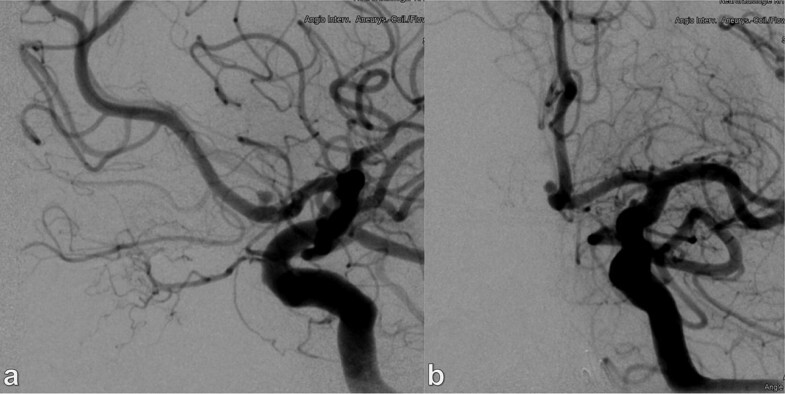 Due to the cranial orientation of the aneurysm and the favorable neck-to-sac ratio, the decision was made for endovascular treatment (EVT) with coils. The patient was extubated the following day and the EVD was removed after six days. The pharmacological management included the routine administration of intravenous (IV) nimodipine. There was no evidence of post-hemorrhagic cerebral vasospasm (CVS) on the daily performed transcranial Doppler sonography (TCD). After an uneventful course, the patient was then discharged into a rehabilitation facility after which she gained complete recovery. Course of treatment: The treatment started with an angiographic examination of all intracranial vessels. An AcomA aneurysm with a fundus diameter of 2 mm and a neck width of 1.5 mm was shown after the injection of the left ICA. A working projection, which showed the aneurysm neck and the entire aneurysm fundus without foreshortening, was selected. The aneurysm was catheterized with the distal tip of the Prowler Select14 catheter at the entrance level of the aneurysm. Given the small size of the aneurysm, the operator tried not to enter the aneurysm fundus with the tip of the microcatheter. From the neck level of the aneurysm a 2/40 mm coil was inserted under fluoroscopic control under road map conditions. The coil was, however, oversized and thus herniated into the A2 segment of the left anterior cerebral artery (ACA) and was therefore removed. After choosing a more appropriately sized 1.5 /20 mm Nano coil (Stryker), the latter was successfully placed into the aneurysmal sack and was detached in a stable position. The final angiographic run showed subtotal occlusion of the ruptured aneurysm. Anti-platelet medication was not required since no implant was inserted into a parent artery. Postmedication: The patient received 2 mg nimodipine IV (Nimotop S, Bayer Vital) per h from day one, then throughout the 10th day after the SAH, which was then switched to an oral dose of 60 mg nimodipine (Nimotop, Bayer Vital) every 4 h (Fig. 3). The patient regained full functionality shortly after discharge. The most recent routine clinical follow-up two years after the treatment showed no residual neurological or functional deficits (modified Rankin Scale: 0, Glasgow outcome score: 5). The first angiographic and cross-sectional follow-up was performed three months after the EVT. 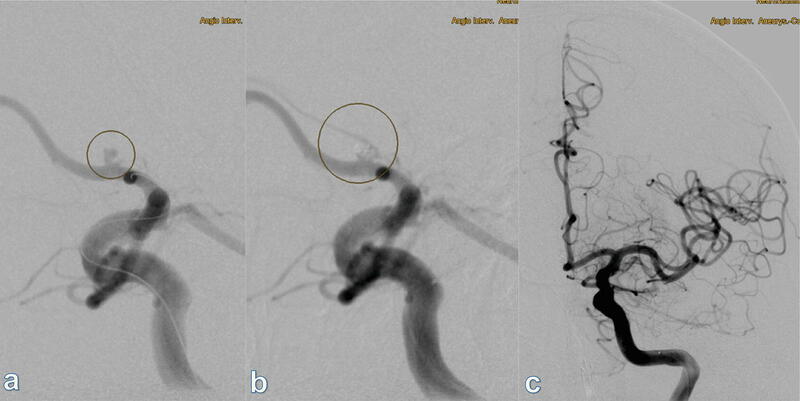 The catheter angiography showed complete occlusion of the previously ruptured aneurysm (Fig. 4). The cranial magnetic resonance imaging (MRI) revealed only minor gliosis at the site of the previously inserted EVD, with the ventricular system now within normal limits. The latest angiographic follow-up was performed two years after the EVT with persistent complete occlusion of the AcomA aneurysm. 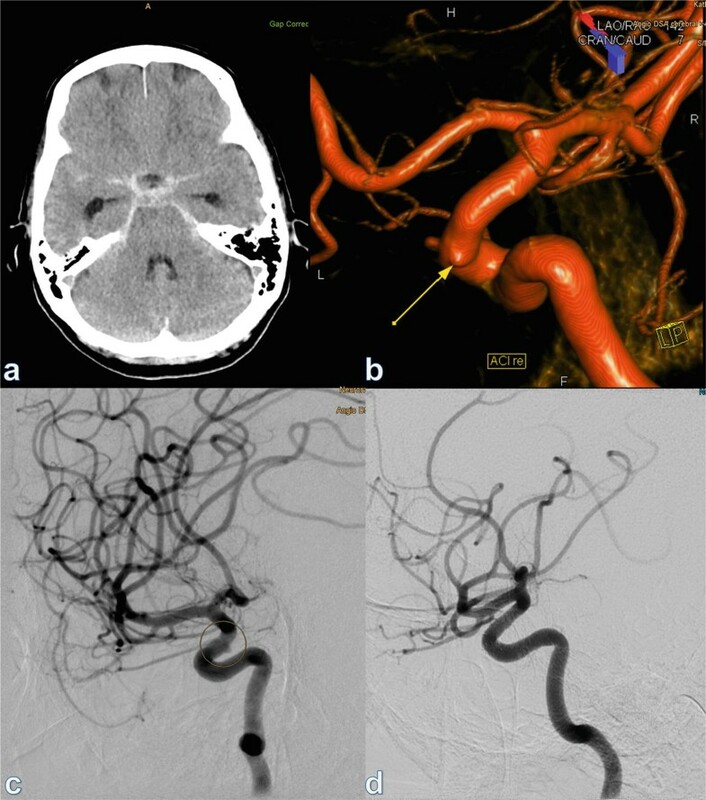 This case represents a typical scenario of a ruptured cerebral aneurysm with favorable anatomy for endovascular management. 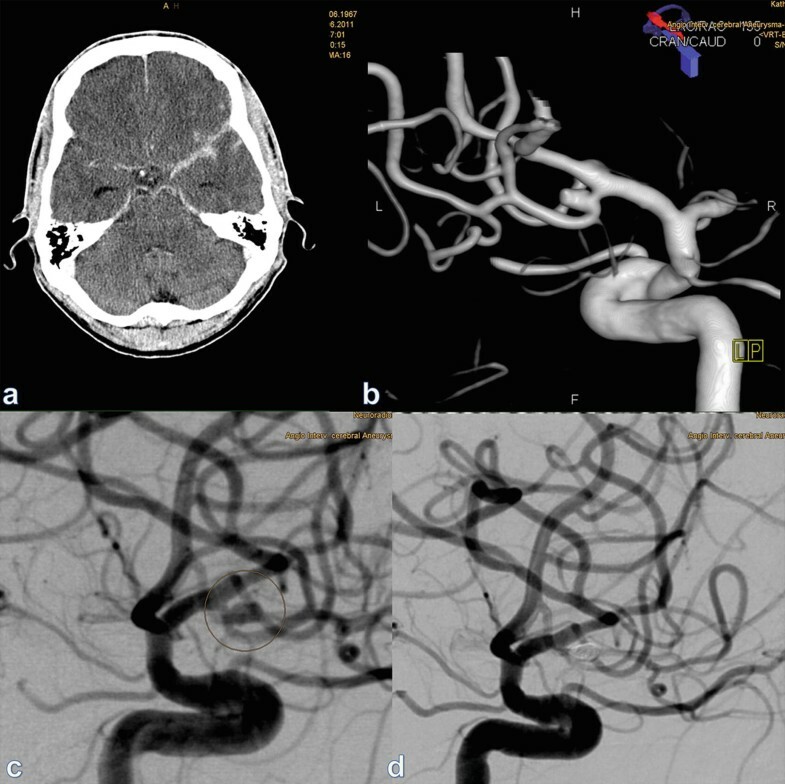 With the appropriate sizing of the coil, the latter of the two remained stable after detachment and was sufficient for complete and stable occlusion of the aneurysm over the two-year follow-up. Interestingly, despite the small size and the relative smooth contour of the aneurysmal sac, the presentation was due to acute rupture and diffuse SAH, which questions the applicability of the results from the International Study of Unruptured Intracranial Aneurysms (ISUIA Investigators 1998) in daily practice. Smaller prospective studies do indeed suggest that the risk of rupture in incidentally detected aneurysms is higher than what was observed in the ISUIA (Yasui et al. 1997; Tsutsumi et al. 2000; Korja et al. 2014). The fact that large aneurysms have a high tendency for rupture does not mean that small aneurysms are always benign; therefore other factors should be considered in the decision-making for treatment of unruptured aneurysms (Wermer et al. 2007). The presented case is an example to demonstrate that there is no absolute lower limit, beyond which the risk of rupture is negligible. This applies not only to aneurysms of the AcomA but extends to almost all other anatomic locations. In fact, the vast majority of the ruptured aneurysms treated in our center over the last decade were (very) small (AlMatter et al. 2017) in size. Figures 5, 6, 7, 8, and 9 show some examples of similarly (very) small ruptured aneurysms at different anatomic locations. The presented case also demonstrates that with the appropriate management in a specialized center, good clinical outcome can be achieved in a subset of elderly patients. Although, it is beyond question that older age is independently associated with unfavorable clinical outcome after aneurysmal SAH (Mocco et al. 2006; Nieuwkamp et al. 2006). Nevertheless, treatment should not be withheld based only on age, especially in case of a good initial clinical condition (Schöller et al. 2013).